Blog from Jack Johnson - New Plymouth, New Zealand | Where is the Love? After 6 full weeks of work we were pleased to reach the well deserved Easter break.Picking up our hire car on Thursday night the plan was a four day road trip finishing with an open air Jack Johnson gig in New Plymouth on the Sunday evening. 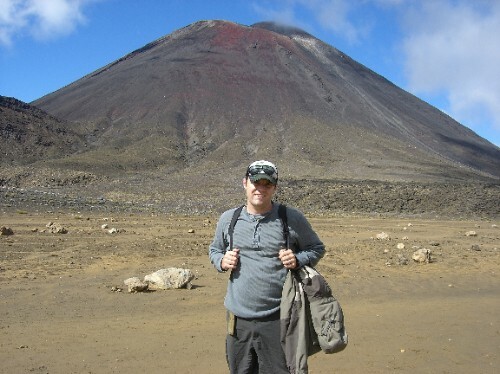 Late on Thursday we arrived in Wanganui but only stopped for the night and set of early Friday to climb Mt Ngauruhoe that we had walked past during the Tongariro crossing (Mt Doom in Lord of the Rings per the earlier blog). It is still a live volcano and the steep sided are covered in gravely volcanic rock.This made the 3 hour ascent extremely difficult but views of the crater and surrounding landscape from the top were amazing; not even the loud Kiwi shouting about American politics could spoil it.The descent however was the real fun part.The loose rock meant you could run to the bottom taking huge giant like steps.Great fun, 3 hours up, 30 minutes down and a few grazes, bumps and bruises to show for it. Once Mt Doom was conquered we headed on to Taupo.The weather was very sunny and hot so we decided to save some money by camping. A fine dinner of pizza and beer was followed by a day of relaxing by the lake side, attempting the hole in 1 challenge to a green in the middle of the lake and our private viewing of Vantage Point at the local cinema.We were literally the only two people in the cinema. unday we headed across to New Plymouth on another fine day.Arriving we decided to treat ourselves to a hotel for the night and went to the tourist information to investigate.Jack Johnson is obviously popular in New Zealand as the entire town was sold out.With the help of a friendly lady at the New Plymouth i site e we luckily found a landlady who was willing to squeeze one more tent onto her site and ended up getting both of us accommodation for $20; this weekend just gets better. A reluctant walk along the promenade was followed by a much more willing intake of Burger Fuel and we were set to see jack at the TSB Brooklands Bowl.The Bowl is a stage in the middle of a lake next to a large grass bank in the middle of a park.We got there early to collect our tickets but had to wait in a huge queue while 1 lady handed out all the thousands of pre ordered internet tickets one by one.There were 15,000 people there. One of the last into the venue we found a good patch of grass and took our seats.Still soaking in the evening sunshine it seemed a beer and wine was in order.The queue for the bar was even worse than the ticket pick up line, not that Hannah could confirm that.Still we finally sat down to enjoy armed with our drinks.Jack was great, very chilled out with a superb encore of better together just as Hannah thought he might not sing it.The drop in temperature as it got dark didn't put some overzealous revelers getting in the lake half way through either. Good concert and great venue. Monday was a leisurely drive back to our base in Lower Hutt and oh no work tomorrow. Ceylan I came from the WebUpd8 blog, not knowing if you read the bcfdeaek there. I'd like to know if it is possible to you to provide the activities overview flip as a separate extension. I'm not a coder myself, so I can't write it myself.On an other note, if you have some coder capabilities to create a hide workspaces switcher extension, that would be cool, but it's not that urgent, and I don't know if you're interested in it.Anyway, this is a great looking distro, I hope it gets traction!